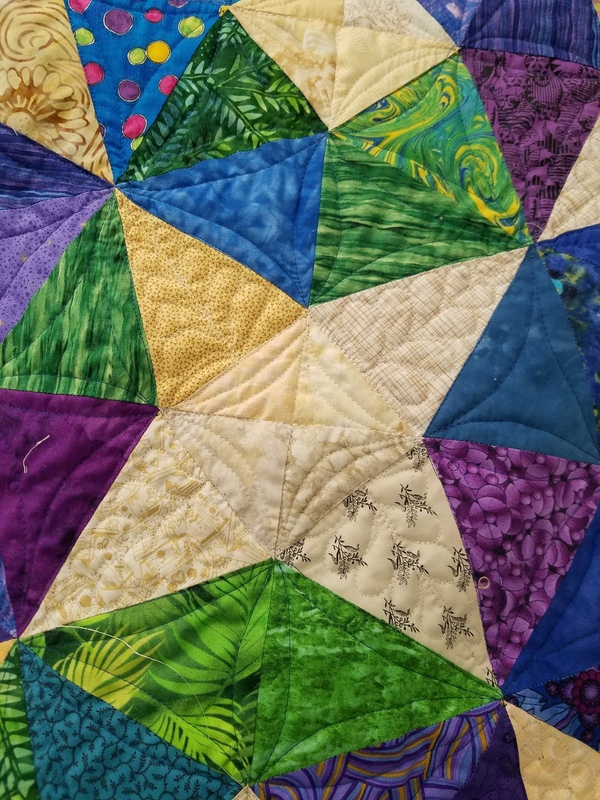 Beth's Blog: QBTS January Meeting Neonatal Quilts and Show and Tell! QBTS January Meeting Neonatal Quilts and Show and Tell! There were a lot of Neonatal quilts turned in this month!! I didn't get pictures of all of them as people were just moving too fast and I am not quick enough!! Below is a good sampling of them. This Guild outdoes itself with participation in this project. 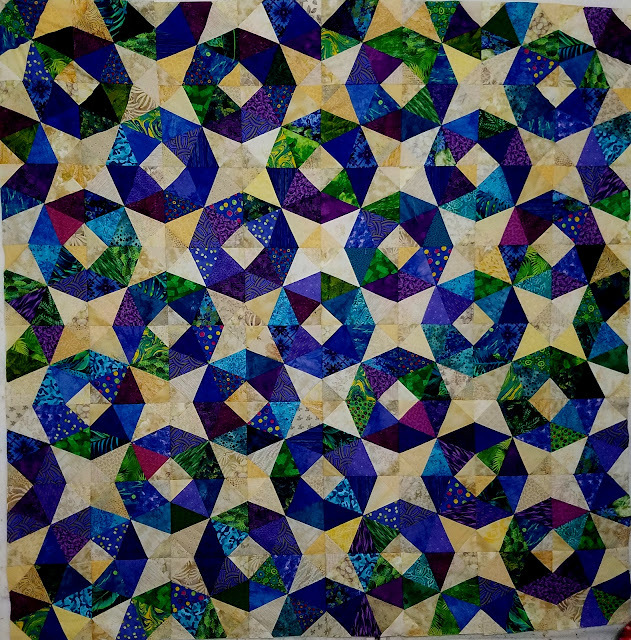 This is the one I did from a quilt provided on the workshop day. There are hearts quilted in the center of each square and it has an adorable penguin backinng. It was flannel and remind me to never work with that again!! This was one of my favorites. As much as I dislike half square triangles, this one tempted me! Carolyn shared the super hero quilt she made for one of her grandsons. She also shared a couple of the place mats she had made using the rug tube technique we have all seen. I may do this. I have been cutting pieces of leftover batting into 2 1/2 inch strips for awhile now and have a bag of 2 1/2 strips as well. Not as pretty as these strips though -- looks like a lot of Kaffe Fassett fabric to me! This was a surprise t-shirt quilt made for a husband who had been begging for one for awhlle! Ann Millard made this adorable baby quilt for a grandchild for her first birthday! This wall hanging got a laugh from all of us! This was made from a panel and was just beautiful! This clever purse was made from several pairs of blue jeans. We all "oohed" over this one -- a labyrinthe. Beautifully made. 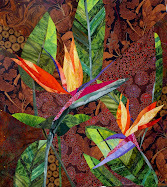 A beautiful use of a panel by Barbara Hatton. These next three are of the same quilt. This one is a closeup of quilting in the quilt. It's a large quilt. It was done as part of some new year goals -- a Triple Irish Chain and a red and white quilt being combined in one quilt. This shows the quilting on the back. 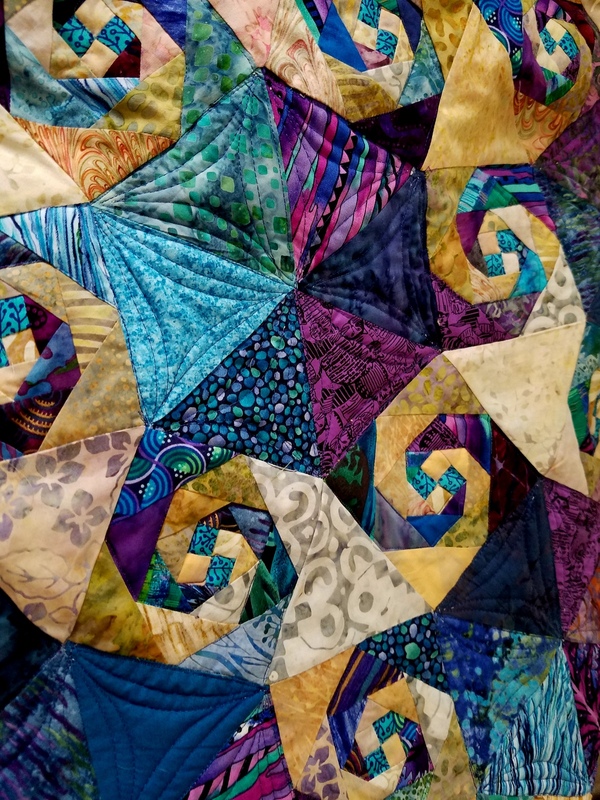 I showed the finished "Quilt from Hell" at the end of the meeting. This is a closeup of the quilting. 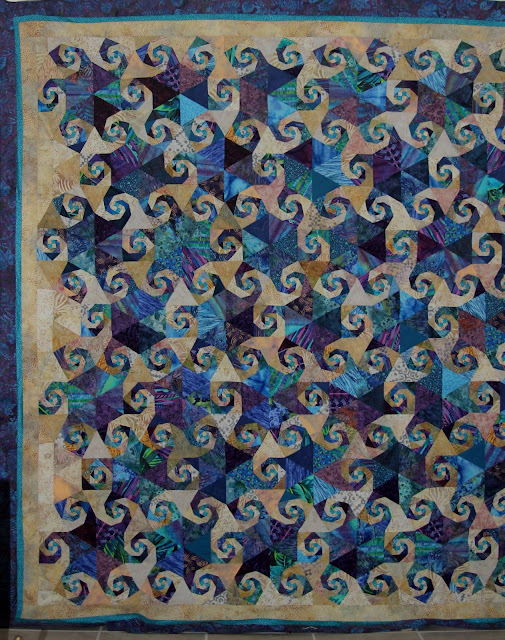 I quilted around each of the arms (Snail's Trails) of the hexagon although I didn't do any stitching in the light areas. I tested some stitching in one and didn't like it at all so let it be. I showed the Blueberry Bagel quilt as well. This is a closeup of the quilting on that quilt. Only 24 Blocks to Go!